"My mom gave me this recipe. It's a very quick and versatile sauce that may be doubled or tripled. Substitute other cheeses and herbs for variety." Discover the secret to sensational pizza sauce. Pretty good but not perfect pizza sauce. I can't put my finger on what's missing so I'll keep looking for that perfect recipe. Definately would not work as a pasta sauce. The sauce was good as a pizza sauce, but does not stand alone. At all. 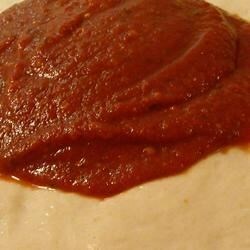 If you're looking for pizza sauce, use this recipe, but if you're looking for pasta sauce, look somewhere else.